Would you like to buy a new printer but do not know which printer meets your requirements? This article will help you make the right choice. u’re looking for an all-in-one printer. The all-in-one printers (also known as MFP or Multi Functional Printers) offer you other features in addition to printing. This includes copying, scanning and sometimes faxing. As a result, you do not need separate devices for scanning or copying documents. Fax functionality is often optional. The two most common types of printers are the inkjet and laserjet. The difference is in the printing technique. As the name indicates, inkjet ink is printed with ink. The laser jet is pressed by attaching toner (powder) to the paper. As regards the print quality, both have their advantages and disadvantages. The inkjet printers generally are very moisture sensitive and printing is not water resistant but will print more brightly, especially important for printing pictures. The laserjet on the other hand has a paler print, not as glossy as the inkjet printer, but the printed result will be more resistant. Both printers are available in color or black and white. While the laser printer will have seperate ink toners for every color, some of the inkjet printers have an all in one color cassette. This means that if one color is empty, you have to replace the cartride. The big difference is mainly in the purchase price and printing costs. Directly through USB: You can connect a printer directly to a PC using a USB cable. You can then send print jobs from the PC or scan documents from the printer to the PC. Network connected or WIFI: This can be done by means of a network cable or wireless via Wi-Fi. For example, the printer is available for multiple devices at a time. You can then drop the printer anywhere and send print jobs from any PC or laptop. Depending on what is the most ideal situation for you, choose a printer with the desired options. 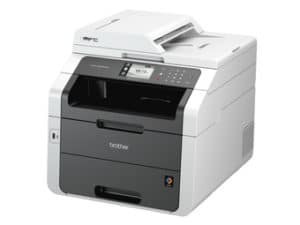 A printer with WiFi support gives you the most options, more about this we’ll tell you something further in this article. Determine for yourself whether these features are interesting to you. Mobile printing One of our most important features is the support for mobile printing. This feature allows you to print from an app on your phone or tablet. For example, Epson and Brother have an app that enables printing on their printers. There are also printers with Airprint support, which makes it easy to print from your iPhone or iPad. You do not need a separate app in this case. Google Cloud printing also gives you the ability to print mobile. Although it is already common, the ability to print mobile is not yet standard. If you would like to make use of this, you should take a look at whether the printer offers this functionality. E-mail and cloud support: There are printers that support e-mail. You can then scan and send a document without the intervention of a PC or laptop. Whether this will often be used in practice is of course the question … Save online Another feature you encounter more often is the ability to scan documents directly from your printer and save online. The printer must support such as Dropbox, Google Drive, OneDrive or Evernote. A major advantage of this is that you can quickly scan documents and then be accessible from any device that has access to this online storage. So what printer to buy? Give our qualified staff a call to discuss!